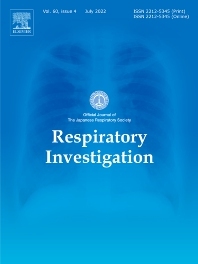 Respiratory Investigation formerly known as Nihon Kokyuki Gakkaizasshi (The Journal of the Japanese Respiratory Society) is the official English - language journal of the Japanese Respiratory Society. The journal published original manuscripts on clinical investigations of a variety of respiratory diseases and medicines, along with articles concerning basic physiology, pathology, and cellular/molecular biology relating to any pulmonary diseases. Our journal is particularly interested in publishing articles that focus on the diversity of disease manifestations based on genetic and/or environmental differences between the East and West. Article types accepted include Original Articles, Rapid Communications, Reviews and Guidelines, Editorials, and Letters to the editor. A case report could be exceptionally accepted only when it contains significant scientific novelty and/or important clinical relevance. The journal enthusiastically welcomes contributions not only from Japanese members of our Society but also from non-members hailing from neighboring countries in Asia and anywhere worldwide.